Portarlington, a coastal township on the north-east side of the Bellarine Peninsula, is 26 km east of Geelong and 43 km across Port Phillip Bay from the centre of Melbourne. The origin of the name is obscure. Possibly it was named after Portarlington in Ireland, a market town south-west of Dublin. Surveyed town lots were sold in Portarlington in 1851, about eight years after Anne Drysdale settled at nearby Drysdale on her pastoral run. The Bellarine Peninsula was an early agricultural region for cereal crops, and later for hay, onions, peas and potatoes. The condition of the roads to Geelong, and the placement of shire tolls on the roads, encouraged farmers to ship produce to Melbourne from the nearest port. Portarlington's first public jetty was opened in 1859, lengthened into deeper water in 1870 and rebuilt a few years later. The small port was also a destination for the Bay steamer excursion traffic. Early industries in Portarlington included a flour mill (1857) and a brick and tile works (1870). The flour mill probably prospered when another at Drysdale was burnt down in 1861. 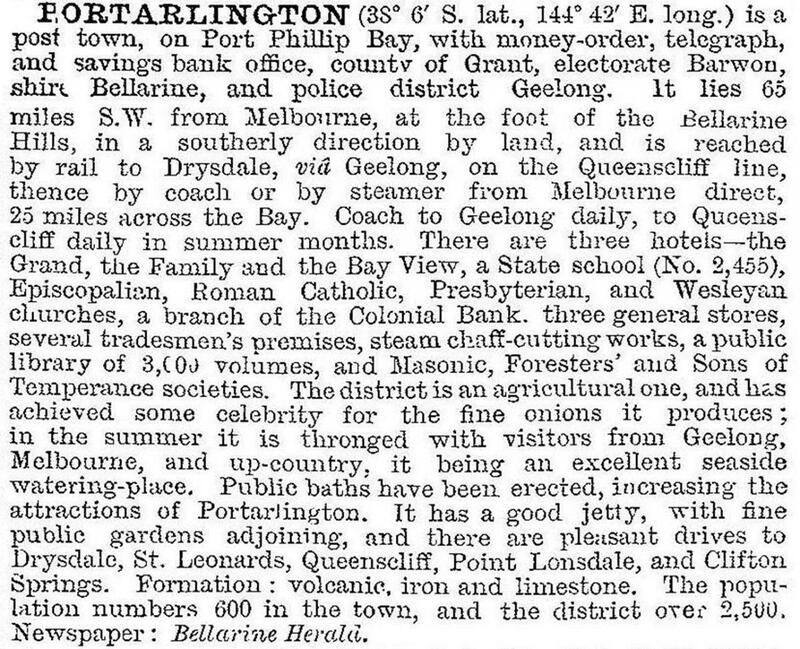 Portarlington settled into a small-town existence, its main industries being vegetables, fishing and grazing. Cargo transport relied on Bay shipping services and the railway which bypassed Portarlington on the route between Geelong and Queenscliff. The land where the racecourse was located west of the town included a common for grazing. The racecourse became a rifle range, and later sports ovals. More importantly, the foreshore reserve in front of the common and racecourse was developed for camping, which brought welcome holiday trade to the town. A golf course, tennis courts and a bowling club provided amenities for holiday makers and for new residents, and Portarlington grew as a retirement area after the 1960s. The foreshore camping ground is extensive, with access-ways named after some of the Bay ships. The common is now a flora and fauna reserve, and foreshore reserves separate the elevated town centre from the beach. Quite near the foreshore in Turner Court there is the Portarlington mill, a registered historic building. The churches, public hall and other facilities are clustered around the shopping area, which contains the prominent Grand Hotel (1887). The annual National Celtic Festival is held in June. The pier was earmarked for renewal by mid-2015. The primary school had 158 pupils in 2014. The median age of residents at the 2011 census was 56 years (Australia, 37 years).